I’ve never been a pasta salad fan, and when I think about it I think pasta and funky vegetables all covered in a thick mayo dressing…the last thing I want on a hot day is a bunch of fat weighing me down! This salad is different. It is fairly light (it is still pasta and cheese, but no heavy dressing! ), and served cool or at room temperature, and I find it to be very refreshing alongside something hot off the grill. It is also perfect for a light dinner on an evening in the park. 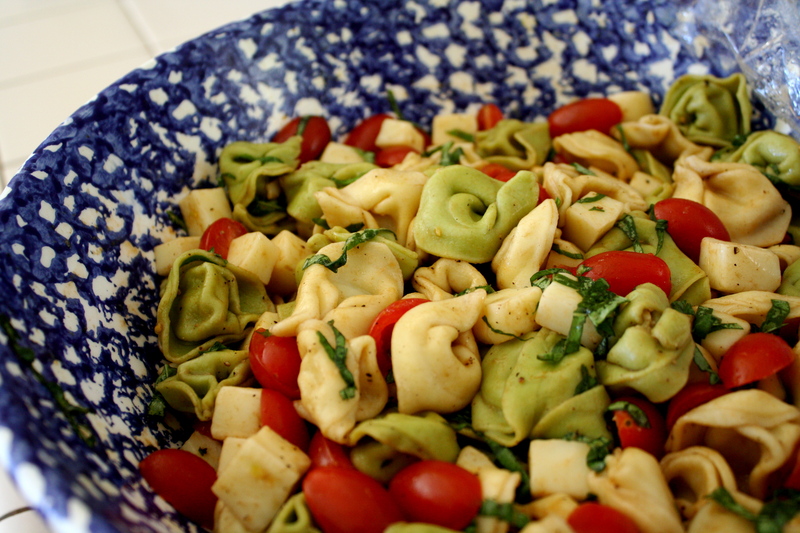 This tortellini salad has been a favorite of mine my whole life. The recipe is my mom’s, and I remember it from countless picnics and school lunches. It’s always a hit and it’s very easy to throw together. I made it for the Fourth of July, and everyone enjoyed it!